Anthropologists receive insufficient support when they give care for other human beings and themselves. We can and must do better. The incompatibility of caregiving and workplace promotion in the United States is widely documented as a challenge to gender diversity in the academy, especially in leadership positions. 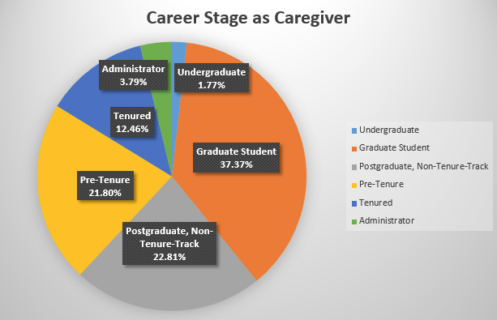 Inadequate support for caregivers in higher education leads to a “leaking pipeline” in the hiring, promotion, and tenure of academics who are primary caregivers and more likely to be female. This is a call to action. All the researchers on this project are caregivers at different stages in their careers who became interested in this topic after observing or experiencing career obstacles as caregivers. It is because giving and receiving care are fundamental to the human condition that we are concerned with the social treatment and career opportunities for caregivers. In 2016, we invited anthropologists to participate in our online survey through the American Anthropological Association (AAA) and academic email lists. As of June 2018, we received 467 responses. We aim to understand how caregiving affects the career trajectories of anthropologists, to identify the formal and informal supports available to caregivers and the structural inequalities they might encounter, and to enrich our understanding of caregiving experiences. We also hope to provide policy, practice, and structural recommendations to the AAA. Our review of caregiving policies found the most effective policies are inclusive, permeable, formalized, supportive, publicized, and contextualize different needs for different caregiving circumstances. Here, we discuss some early findings. Forty-five percent of participants reported caregiving had “mostly negative effects” on their careers and another forty percent reported both negative and positive effects. Survey results confirmed caregiving disproportionately falls to a single caregiver who is usually female. Although caregiving is most often a chronic concern (74.8 percent of respondents), it is treated as a temporary condition. Workers receive time off or concessions only during the most intense periods of stress or caregiving even though their responsibilities last years. 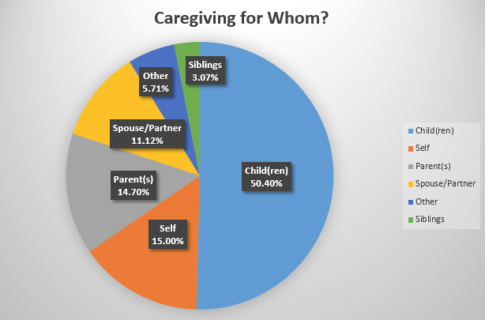 Most respondents (68.8 percent) were caregiving as parents but respondents also cared for partners, parents, grandparents, siblings, aunts and uncles, fictive kin, and of course, themselves during severe illnesses. Caregiving to parents and partners often creeps up unexpectedly. As more academics come from more varied economic backgrounds, the impact of caregiving may be increasingly uneven. Seventy-five percent of the participants said there was no end in sight to their caregiving obligations. Ninety-two percent of participants, who ranged from students to non-academic anthropologists to tenured faculty to administrators, said the AAA should address the impact of caregiving on anthropologists and their careers. Only 20 percent of participants reported awareness of or access to existing structural accommodations like the Family and Medical Leave Act of 1993. 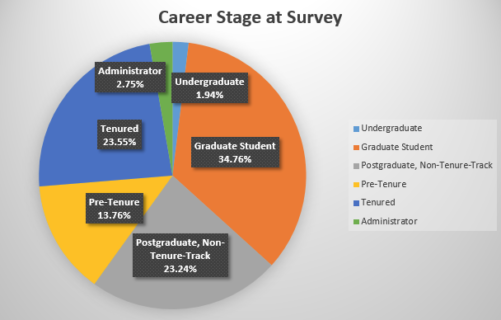 A partial explanation for lack of access can be explained by non-tenure track faculty and graduate students who participated in the survey. These participants may be especially vulnerable—for example, a graduate student not allowed to describe their caregiving responsibilities in a request for a dissertation extension; or another who struggled to keep up when their school-aged child attempted suicide; and part-time faculty and staff who do not have access to full benefits. Forty-seven percent of participant academic caregivers attempted a negotiation to modify their responsibilities during periods of intense caregiving. Of those participants who did attempt a negotiation, 17 percent reported negotiations had both positive and negative effects, only 6.7 percent had mostly positive effects, and 18 percent reported mostly negative effects. In academia currently, we are expected to keep the personal in the private domain. However, most of us are or will be caregivers at some point in our lives or have self-care needs. This is often described as a balancing act between work and family lives—reinforcing the imagery of separate realms that must be kept apart. But caregivers know this is a false dichotomy. Our caregiving affects our careers and our careers affect our caregiving. What does it say about academia more broadly if in a field like anthropology—generally considered progressive and fundamentally concerned with the well-being of humanity—academics receive insufficient support when they give care for other human beings and themselves? Is this a conflict of interest? If so, how can we do better? Half of female participants (50 percent) reported that they had all or almost all caregiving responsibility or were the primary caregiver with only occasional assistance. A little more than half of male participants (52.5 percent) said they shared, more or less evenly, caregiving responsibilities. Twenty-three percent of females reported they shared caregiving more or less evenly; 17.5 percent of males said they had all or almost all caregiving responsibility or were the primary caregiver with only occasional assistance. (Only one participant that identified as transgender/sexual or non-binary responded to one of these categories on this question.) This suggests females are at greater risk for negative career impacts because they perform more caregiving work. A question sometimes whispered behind closed doors to only the most trusted advisors is “When is the best time to start a family?” Students and non-tenure track positions lack structural and formalized policies to protect caregivers. At every stage of career, there are intense work demands, deadlines, and accusations of not taking work seriously. Each stage—graduate school, pre-tenure, and tenure—is fraught with career landmines for the primary caregiver. The next stage of the study is to follow up with participants via interviews and focus groups to understand the personal and professional ramifications of caregiving better and to generate recommendations from anthropologists who are or have been primary caregivers. If you would like to participate in a focus group at the 2018 AAA Annual Meeting, please email one of us through the contact page at Academic Carework. It is not necessary to have completed the survey to participate in the focus group, but we hope you will! Nikky Greer is a PhD candidate in the Department of Anthropology at Temple University. Jill Fleuriet is associate professor in the Department of Anthropology and associate dean of the Honors College at the University of Texas at San Antonio. Rebecca Galemba is assistant professor at the Josef Korbel School of International Studies and co-director of the Korbel Latin America Center at the University of Denver. Sallie Han is professor and chair in the Department of Anthropology at SUNY Oneonta. I am so grateful to see research and an article on this topic. While it is important to recognize the demands of care taking on anyone who has these responsibilities, as you note, caregiving most often falls to females, with significant effects on their careers. Caregiving is critical work in any society, yet so often unrecognized and undervalue.